YMF in collaboration with Lucknow University Alumni Association organized a Counseling Workshop on ?Carrier Alternatives for Commerce Students? for class XII and B.Com students on 31 March 2018. The lead speaker was Mr. Devesh Agarwal Chartered Accountant and Coordinator YMF. Lucknow Management Association jointly with India Institute of Management Lucknow organized a two day Workshop on How to Scale-up Your Enterprise on 31 March and 1 April 2018 at IIML Campus. Mr. Mr. Anup Chandra Pandey IIDC, U.P. was the Chief Guest in the inaugural session chaired by Prof Neeraj Dwivedi Prof Strategic Management IIM Lucknow. The technical sessions were addressed by Dr. Kavita Pathak Director Jaipuria Institute of Management, Mr. Sumant Pai from Yash Papers, Dr. Ashok Kumar and Dr. Manoj Joshi from Amity Business School, Mr. Anuj Agarwal Managing Director Gyan Milk, Mr. Amod Gujral Managing Director Encardiorite and Dr. Kshitij Awasthi from IIM Lucknow. The workshop included presentation of live case studies of three successful world class companies in Lucknow with sessions on Entrepreneurial Marketing, Managing for Volatility, Uncertainty, Complexity, Ambiguity (VUCA), Leadership and Strategy for Growth of New Enterprises. LMA organized a session on Neuro Linguistic Programming (NLP): A Tool for Achieving Excellence in Academics on by Dr. Dheeraj Mehrotra on Sunday 25 March 2018. Neuro-linguistic programming (NLP) is an approach to communication, personal development, and psychotherapy created by Richard Bandler and John Grinder in California, United States. NLP's creators claim there is a connection between neurological processes (neuro-), language (linguistic) and behavioral patterns learned through experience (programming), and that these can be changed to achieve specific goals in life. Dr. Dheeraj Mehrotra is an Academic Evangelist, at Next Education India Pvt. Ltd., with over 27 years of experience as an academician. His expertise lies in implementing TQM, Six Sigma, 5S, Kaizen, Experiential Learning, Parenting and (Neuro Linguistic Programming (NLP) in academics. A President of India Awardee, Dr. Mehrotra has published over 45 books and has trained over 6,000 Teachers globally on Classroom Management, NLP, Quality Management and Six Sigma in academics. LMA in collaboration with NHRDN and TiE organized a presentation on Bitcoins and Blockchain Technology: Some Disruptive Applications on 23 March 2018. The speaker was Mr. Akshay Kumar Gupta, a B.Tech in Computer Science and an IBM Certified Blockchain Expert. He is a Blockchain Consultant at AKG, a Kanpur based start-up being run by him. Under the project Improving Effectiveness of Pradhan Mantri Kaushal Vikas Yojana initiated by LMA jointly with LeadWynn. About 200 interns of PMKVY were assessed and those selected to take a certificate course in service Science Associate Programme comprising four sessions of 90 minutes each. These modules were on themes a) Self-assessment and Introduction of Service Science: Bridging the gap between competency and market demand, b) Principles of good service delivery and Market Opportunities: Awareness about market needs (Guest lectures by people from Gliteratti and Titan), c) Project management: Learning basic steps of management and its applicability and d) Application of six- Sigma approach for better delivery which were conducted in two batches. Dates of Batch II - Dates of Batch II - Feb 20, Feb 26, March 6 and March 15 2018 The faculty comprised Dr. Alka Jain and ms. Somya Gupta under the overall guidance of Dr. Rajan Johri M.D. LeadWynn. Under the project Improving Effectiveness of Pradhan Mantri Kaushal Vikas Yojana initiated by LMA jointly with LeadWynn. About 200 interns of PMKVY were assessed and those selected to take a certificate course in service Science Associate Programme comprising four sessions of 90 minutes each. These modules were on themes a) Self-assessment and Introduction of Service Science: Bridging the gap between competency and market demand, b) Principles of good service delivery and Market Opportunities: Awareness about market needs (Guest lectures by people from Gliteratti and Titan), c) Project management: Learning basic steps of management and its applicability and d) Application of six- Sigma approach for better delivery which were conducted in two batches. Dates of Batch I - Feb 1, Feb 6, Feb 13, and Feb 17 2018. The faculty comprised Dr. Alka Jain and ms. Somya Gupta under the overall guidance of Dr. Rajan Johri M.D. LeadWynn. In the LMA Awards Evening 2018 on 19 March, LMA honoured nine woman achievers in different fields, conferred Outstanding Management Professional Award 2018, Best Start-up Award and Life Time Achievement Award. Woman Awardees were Ms. Satya Singh (Governance), Ms.Surekha Waldia (Entrepreneurship), Ms. Sapna Upadhyaya (Social Service), Dr. Tripti Singh (Corporate), Dr. Meenakshi Pawaha (Academics), Ms. Rachna Govil (Sports), Ms. Sunita Jhingran (Culture), Prof Roop Rekha Verma (Life Time Achievement), Dr. Vishwajeet Kumar (Outstanding Professional Manager) and Mr. Sachin Sahani (Best Start-up). Prof Roop Rekha Verma Former Vice Chancellor Lucknow University delivered a talk on Gender Equality. Mr. Alok Ranjan Former Chief Secretary was the Chief Guest and Mr. Anup Chandra Pandey President LMA chaired the event. U.P. Investors Association jointly with LMA organized an interactive session on 17 March 2018 The World Consumer Day . World Consumer Rights Day recognized by the United Nations was inspired by President John F Kennedy, who sent a special message to the US Congress on 15th March 1962, in which he formally addressed the issue of consumer rights. He was the first world leader to do so. Senior bankers, financial, legal service experts to highlight the need of awareness about consumer's rights and financial matters among common public. A book titled ?Paisa Aapka: Bhavishya Aapkaa? authored by Shri Ajay Shukla, Ex-Member Traffic, Railway Board was released on the occasion. On 8 March 2018, the International Women?s Day, LMA in collaboration with AWOKE India Foundation and Jaipuria Institute of Management organized a conference on ?Empowering Women through Financial Awareness?. Speakers included Prof Kavita Pathak Director JIML, Mr. A.K. Mathur Sr. Vice President LMA, Mr. Pravin Dwivedi President AWOKE India Foundation, Ms. Neyha Mehrotra of Reliance MF and Ms. Aparna Awasthi Dy. GM (Outreach), SBI. YMF of LMA in collaboration with The Institute of Chartered Accountants of India , Lucknow and FM Radio organized a a two day event ?Saman " on 10th and 11th February, 2018 at CA Institute, Gomti Nagar. Many activities like extempore speech making competition, knowledge sharing session, poster making competition, solo and group singing competition were organised in the event. A panel discussion on the theme "Leadership in the Age of Disruption" was organized on 23 Feb 2018 as a part of Management Day celebrations,. The panelists were Dr. Rajan Johari Managing Director LeadWynn, Dr. Kavita Pathak Director Jaipuria Institute of Management Noida/Lucknow, Mr. Kumar Ranjan, Director Artificial Intelligence, Mean Metal Motors Bangalore and Mr. Saud Usmani Sr. Manager HR Tata Motors. LMA in collaboration with Amity School of Languages, Amity University Lucknow Campus Organized an International Conference on "Language Skills: Mother of all Employability" 0n 22-23 February, 2018. About 100 papers on the theme were presented in the conference. Mr. Alok Ranjan Former Chief Secretary was the Chief Guest in the inaugural session and Mrs. Swati Singh, Minister of State of Women Welfare, Family Welfare, Maternity and Child Welfare in the UP government in the Valedictory session. Other invited guest speakers included Prof Nishi Pandey, Professor Department of English and European Languages , University of Lucknow, Mr. A. K Mathur, Sr. Vice President, LMA, Mr Viveik Pandit, Renowned Author and Freelance Journalist, Mr Olivier Litvine , Linguistics Attache in French Embassy , New Delhi, Mr.Richard Franco , Director, Alliance Francaise, Prof.Ranu Uniyal, University of Lucknow and Dr (Prof) Kum kum Ray Director Amity School of Languages. LMA in partnership with Amity University, Govin Capital Singapore, LEADS, TiE Lucknow Chapter, Headstarts, and EO, organized an event titled "Lucknow #Leads Start-up I Investment I Innovation" supported by SIDBI Investment vertical, the Fund of Funds for Start-ups on 19 February. 28 student groups of potential start-ups and already working start-ups presented their business plans in different sectors before four investors viz. Venture Catalyst, Indian Angel Network, India Quotient, and Unicorn Venture Partners (last two nominated by SIDBI) who acted as Jury. In run-up to this event LMA in collaboration with LEADS conducted a series of workshops at various business schools where the students presented their ideas and business plans which were shortlisted for presentation in the event. One winner and two runners up were selected by the Jury who were offered mentor-ship by Indian Angel Network. Mr. Alok Ranjan Former Chief Secretary U.P. was the Chief Guest in the inaugural session. A penal discussion on " Developing Lucknow as a Start-up Hub? was also organized in the event. LMA in association with PHD Chamber of Commerce and Industry and Turtle Survival Alliance organized an interactive session Prakriti 2018 ? A wildlife Enthusiasts Meet on Saving our Wetlands for sustainable Ecology on 18th of February 2018. Wetlands are amongst the most productive yet endangered ecosystems. The objective of the event was to highlight the importance of Wetlands and their unique wildlife, gather support for their conservation and discuss the roadmap for Wetland Conservation in Uttar Pradesh. Speakers were Dr. Asad Rehmani Former Director, Bombay Natural History Society and Scientific Consultant to Corbett Foundation, Dr. Ritesh Kumar Head of Technical Programme of Wasteland International South Asia, Dr. B.C. Choudhary Wildlife Scientist and professor Wildlife Institute of India and Dr. Bivash Pandav wildlife Expert at Department of Endangered Species Management, wildlife Institute of India. LMA organized its annual Managers Day Out, an offsite programme at one of the Farm Houses on outskirts of Lucknow on 11 February 2018 with lots of Management Games combined with fun and frolics Member?s families. LMA jointly with AWOKE India Foundation organized a panel discussion on ?Need of Financial Literacy in Changing Economic Environment on 9 February 2018. The participants were prof Shubhendra Parihar Jaipuria Institute of Management, Mr. A.K. Mathur Sr. Vice President Mr. Pravin Dwivedi President AWOKE India Foundation and Mr. S.K Mishra former Chief Manager Oriental Bank of Commerce. Under mandate from the Government, LMA organized an interactive session for stakeholder?s consultation on ?Draft Uttar Pradesh Policy on Pharmaceutical Manufacturing 2008? on 2 February 2008. Representatives from Central Drug Research institute, National Botanical Research Institute, Biotechnology Park, Pharmaceutical Manufacturing Units, Assocham and Ernst & Young, besides LMA members participated in the session and provided their inputs on the draft policy. Mr. Anup Pandey Infrastructure & Industrial Development Commissioner, Uttar Pradesh and President LMA chaired the session. LMA in association with Society for Indian Automobile Association Manufacturers and Ernst & Young organized an interactive session for stakeholder?s consultation on UP ELECTRIC VEHICLE MANUFACTURING POLICY 2018 on 1 February 2018. Besides LMA, the participants included senior Management representatives from Piaggio Vehicles Mahindra & Mahindra, TVS Motors & Co, Tata Motors, Toyota Kirloskar, Honda Cars, Hyundai Motors, Mahindra Electric and Maruti Suzuki. Mr. Anup Pandey Infrastructure & Industrial Development Commissioner, Uttar Pradesh and President LMA chaired the session. LMA in collaboration with AIMA and Dr. A.P.J. Abdul Kalam University organized a Conference on Leadership in the Age of Disruption on 30 January 2018 The Guest of Honour and Keynote Speaker was Mr. T.V. Mohandas Pai Chairman Manipal Global Education and President All India Management Association. Ms. Rekha Sethi Director General AIMA and Prof Vinay Pathak Vice Chancellor also spoke in the the inaugural session. There were eight presentations on disruptive technologies by IBM, HCL, Apollo Hospital, and PTC and by start-ups in Chatbot, 3D printers, Robotics and Electric Driver-less cars. All local Management Associations of Uttar Pradesh were partners in the event. LMA had conducted a research study on Ease of Doing Business in Uttar Pradesh during 2016-17. An interactive session was organized on 29 January in which besides, the members of LMA research group, Departments of Industrial Development, Commercial Taxes, Environment, and Power participated. The Departments shared various actions taken by the Government on recommendations made in the report. IIDC U.P. Government who chaired the session, instructed the officials to get i orders issued to concerned the departments to comply with various recommendations on which action was present. During the interaction LMA proposed periodical stakeholders perception surveys to identify implementation gaps in the declared policies. LMA in collaboration with BBD University organized a Workshop on "Presentation of Business Plans" on 23 January. The workshop was conducted by Mr. Kumar Ranjan Director Artificial Intelligence Mean Metal Motors, Bangalore who provided the guideline and made the student participants to present their business ideas and plans. Six teams presented their plans. Team 1- Victoria?s secret presented their business plan on the theme- ?creating card boards from waste straw?, Team 2- Dew Drops on theme- ?Creating a Logistic System to Benefit Farmers by Supplying the Agricultural Produce Directly to Customers Without Involving Middle-Men?, Team 3- New Era Start-up on theme- ?Providing FMCG products to hostelers and paying guests?, Team 4 on theme- ?RFC Electric Vehicles - Regenerative batteries for electrical vehicles, Team 5- DIGICISO- on theme- Cyber security application for corporates, and Team 6- Catch Mechanic on theme- ?Providing car servicing and car repair at home or anywhere at a very nominal price? LMA organized the AIMA Management Olympiad 2018 on 24 and 25 January with multiple events over the two days as per AIMA?s format in Shri Ramsawroop Memorial Group of Professional Colleges which hosted the event. Professor Ajit Prasad Director IIM Lucknow was the Chief Guest in the inaugural session and Mr. Anup Chandra Pandey IAS Infrastructure and Industrial Development Commissioner, Govt. of Uttar Pradesh who is also President LMA gave away the medals and trophies. AIMA?s team supported the event. This was the second Olympiad organized at Lucknow, the first being on the same dates in the year 2017. Young Managers Forum of LMA in collaboration with National Post Graduate College Lucknow organized a workshop on ?Smart Study Skills? on 18 January 2018. The speaker was Mr. Devesh Agarwal Chartered Accountant and Coordinator YMF. LMA Young Managers Forum collaborated with FolkTales @ Golden Future in a session on 21 January 2018 with Ashwin Kailasnath Senior Manager, Hero Motorcorp, Surabhi Jain Nutrionist & Founder Nutriwell India, Chandra Shekhar Varma Author & Entrepreneur, Kena Shree, Senior HR NTPC & Writer and Najaf Rizvi VP and Regional Head ICICI Securities.. Tea Stories is a venture of FolkTales @ Golden Future started by Raj Smriti and Shobhit Narain. It is about Conversation...Inspiration...Celebration! It's about human relations we believe ... but as we are so engrossed in our daily life that we forget the importance of people around us. We know who they are, but don?t really know how they have reached that level and we can draw some powerful lessons from their life and imbibe them into our day today dealings. LMA conducted an Employability Enhancement outreach program for underprivileged young men and women Participants were unemployed young women who have opted for healthcare services as a choice of vocation and were from outskirts of Lucknow. The programme was conducted on 19 January 2018 by Dr. Rajan Johri Managing Director LeadWynn, a Service Science Consultancy. LMA interacted with Mr. Douglas Fowler, Economic Officer, U.S. Embassy, North India office, New Delhi and Mr. Daniel Mitchell, Economist, Center for Freedom &Prosperity in a joint LMA-Cuts International Focused Group Discussion on ?India and the US-Learning from One another?s Experience vis-vis Competitiveness and Ease of doing Business on 19 January 2018? LMA research group on EODB in Uttar Pradesh presented an overview of the methodology and findings and update on implementation of its report to Govt. of U.P. on the subject. Mr. Daniel Mitchel made a presentation on ?Federalism and Prosperity? LMA collaborated with The Associated Chamber of Commerce and Industry of Uttar Pradesh and The Business Standard in a Pre-Union Budget Panel Discussion with on 16 January 2018 Panelists included Mr. B.B. Jindal Chartered Accountant & Past President LMA, Mr. B.C..Sethia Industrialist, Mr. Shailendra Jain President, ASSOCHAMUP and Business Standard. In another outreach programme, an interactive session was organized on 9 January 2018 with Gram Pradhan and local volunteers supporting another Government primary school at village Misa in block Gosainganj under the transformation project of I Care India to understand the challenges being faced by them and offer solutions and support. Prof Kriti Bardhan Gupta of IIM Lucknow and Dr. Shirin Abbas CEO Mediacom Consultancy joined LMA in the interaction. In its endeavour to promote and facilitate UP?s trade and investment Exim Bank has embarked on a study to assess the export potential of Uttar Pradesh. To understand and get deeper insights, LMA, FICCI, and Exim Bank organized an industry interaction on 12 January 2018 to analyse the bottlenecks faced by the industries of UP in expanding trade and help the companies to take advantage of the emerging opportunities in the global markets. Speakers included Mr. L.K. Jhunjhunwala Chairman FICCI U.P. State Council, Mr. Prahalathan Iyer Chief General Manager Exim Bank, Mr. Anil Kumar Principal Secretary MSME & Export Promotion, and Mr. Alok Kumar Principal Secretary Infrastructure and Industrial Development. An interaction followed the presentations. Mr. Anoop Chandra Pandey IIDC Uttar Pradesh and President LMA chaired the session. LMA organized a Workshop in collaboration with Amity University Entrepreneurship Cell on 10 January 2018 on Pitching with a Workable Start-up Business Plan for an event scheduled in February 2018. Mr. Kumar Ranjan Director AI Mean Metal Motors Bangalore conducted the Workshop. Six teams of students discussed their ideas for start-up companies and worked on business plans to be taken forward under guidance of Mr. Ranjan. Mr. A.K. Mathur Sr. Vice President LMA, Major Gen K K Ohri Pro Chancellor Amity University and many Deans and Professors of the University attended the workshop. LMA organized its 38th Annual General Meeting on 6 January 2018 in which election of new office bearers was also conducted. Mr Anoop K. Pandey was elected as President, Mr. A.K. Mathur as Senior Vice President, Mr. Pravin Dwevedi as Vice President, Dr. Dheeraj Mehrotra as Secretary and Mr. Devesh Agarwal as Treasurer. For his invaluable contribution to LMA, Mr. Alok Ranjan, the outgoing President was appointed as Patron. LMA collaborated with state owned Institute of Cooperative and Corporate Management Research & Training (ICCMRT) in a one day workshop Srijan on 21 December 2017 which comprehensively discussed various aspects of GST with special reference to Coopertives. Mr. Atul Agrawal, Department of Revenue, Ministry of Finance, Government of India spoke on ?Overview of GST?, Mr. P.K. Agrawal, Financial Adviser, Cooperative Department, GoUP on ?GST and Cooperatives?, Mr. Vikas Asthana, Department of Revenue, Ministry of Finance, Government of India on ?Invoicing System under GST, Input Tax Credit and Time and Value of Supply?, Mr. S.K. Singh, IFFCO, Lucknow on ?GST Implementation in Cooperatives? CA Shashank Mittal on ?Taxation Processes in GST Regime? and Prof. Jabir Ali, Principal, ICCMRT on ?GST and Business Performance?. Hon.Shri. Mukut Bihari Verma, Cooperative Minister, Government of Uttar Pradesh inaugurated the programme. Lucknow is emerging as one of the most polluted cities in the country and the more surprising and worrying fact is that level of indoor pollution is many times more than outdoor pollution with more serious harmful medical effects than outdoor pollution. In this context, LMA in collaboration with Clean and Green Environmental Society Lucknow, organised two presentations in a lecture meeting on "Role of House Plants for Cleaning Indoor Pollution" on 27 December 2017. Speakers were Dr. S.C. Sharma, Secretary General, Clean and Green Environmental Society who spoke on various house plants for cleaning indoor pollution and. Dr. Shirin Abbas, CEO Mediacom Consultancy spoke on Terrarium and its dual role as an indoor decorative plant and anti-pollutant, with many commercial possibilities being more effective than costly air purifiers available in the market . To sensitize school children on basics of Management, Young Managers Forum of LMA in collaboration with S.P. Marg Lucknow Branch of Army Public School and Bhram Kumaris World Spiritual University organized a short course on 27. Sister B.K.Swarnlata of Bhram Kumaris spoke on Stress Free Studies and Meditation. Mr. Devesh Agarwal Chartered Accountant and Coordinator YMF shared with students some Memory Improvement Techniques and Prof. Jameel Akhtar Ansari (Alumini IIM Calcatta and IIT Kharkpur) spoke on General Management and Awareness. LMA organized an industry visit to Chopra Retec Rubber Products Ltd located in Chinhat Industrial Area on 26 December 2017. CRRPL Is a leading manufacturer supplying accessories to the exhaust/silencer systems industries world- wide and has a wide range of parts which it exports to Europe, U.K., USA, Canada, Middle East, Far East, Australia and New Zealand. The guided round of the factory was preceded by a presentation by Mr. Kiron Chopra Chairman & Managing Director of the Company. LMA joined with AWOKE India Foundation, a non-profit in a panel discussion on Improving Financial Literacy on 16 DEcember 2017. The objective of discussion was to improve the level of financial literacy across all segments of society which was currently very low even in otherwise educated class and still lower in rural areas. AWOKE India Foundation has been founded by a former banker from Stanchart and HSBC. The participants included leaders from various fields who decided to contribute through a variety of interventions including a conclave in collaboration with SEBI and a series of outreach programmes focused on self help groups of women in rural areas. LMA partnered with I care India in a Workshop, exhibition and performances to show case the improvement in school children brought about by the interventions being organized by I care India on 15th December 2017 LMA has been supporting the initiatives of I care India a social non-government organisation which is running a programme called Ankurum for transforming 100 government primary schools by involving various stakeholders. LMA in collaboration with some academics is also working on a Government sponsored evidence based research study on this initiative. Dr. Rita Bahuguna, Cabinet Minister Women Welfare, Family Welfare, Mother and Child Welfare and Tourism, Mrs. Anupma Jaiswal, Minister Basic Education; Sh. Anil Swarup, Secretary School Education & Literacy MHRD Govt. of India, Sh. Atul Kr. Gupta, Former Chief Secretary; Sh. Alok Ranjan, President LMA and many others were present in the day-long event. Sh. Anil Swarup, IAS, Secretary School Education MHRD delivered the keynote address on ?Importance of Community Engagement in Transforming Primary Education? LMA organized an interactive session with a delegation of senior officers from College of D?fense Management Secundrabad lead by Brigadier Dr J S Rajpurohit on 13 December. LMA team comprised its core group headed by Mr. Alok Ranjan President LMA. There was a meaningful exchange of information about the two organizations and discussion on a wide range of issues of mutual interest. CDM proposed collaboration with LMA in some of the programmes of their interest. As a high-profile outreach event, LMA organized a National Horticulture Workshop for farmers in Village Daulatpur District Barabanki, about 45 km from Lucknow. The event was organized in collaboration with a progressive farmer Ram Saran Verma of the village who have not only developed techniques of significantly increasing the yield of some fruits and vegetables but also has been catalysing growth of lacs of farmers in the state. Rma saran Verma?s initiatives led to substantial increase in income of farmers. For this achievement he has been awarded by many organizations including state and central Government agencies. Hon. Governor of Uttar Pradesh Shri Ram Naik inaugurated the event. Among those who spoke were Mr. Alok Ranjan President LMA, Ms. Priyanka Rawat Member of Parliament from Barabanki, Dr. Hasib Akhtar Vice Chancellor Narendra Dev Agriculture University, Faizabad, Shri Ketan Patel a progressive farmer from Gujarat who shared best practices in Horticulture from Gujarat with over 1000 farmers present in the event. All proceedings were carried out in Hindi. An evidence based LMA-ICCMRT joint research study titled ?Impact of Improved Agriculture Practices in Daulatpur Village of Barabanki District on Socio-Economic Conditions of the Region? was released by the Hon. Governor. IFFCO supported the event. LMA organized a joint visit of PTC Industries by LMA members and a team of senior officers from College of Defense Management Secunderabad on 13 December 2017. PTC Industries is a World Class foundry will all automatic robotic controls. They have many big names as clients across the world. Mr. Sachin Agarwal Chairman & Managing Director PTC made an introductory presentation before a 1 ? hour hour visit to the factory. LMA in collaboration with Medanta-The Medicity organized a wellness programme on ?Stomach and Liver Related Ailments and Their Management? on 12 December 2017.The eminent speakers were Padmashri Dr. Randhir Sud and Dr. Neeraj Saraf. Dr. Randhir Sud, a renowned Consultant at Medanta & Chairman, Institute of Digestive and Heptatobillary Sciences is a gold Medallist and ?Master of Endoscopy? conferred by India Society of Gastroenterology. He is credited with establishing and integrating therapy with GI Endoscopy in India. Dr. Sud is a Visiting fellow at Harvard Medical school. Dr. Neeraj Saraf is a leading expert in liver deceases in the country. He is one of the most experienced Gastroenterologists in the country for treating Hepatitis C besides having treated 2500 liver transplant patients. Apart from his clinical expertise, Dr. Saraf believes in treating patients with compassion, empathy at minimum cost. LMA in collaboration with Medanta-the Medicity and Era University, Lucknow organized an Interface with Dr. Naresh Trehan on 9 December 2017. Dr. Trehan, the famous cardiovascular surgeon, recipient of several National and International Awards including Padmashri (1991) and Padma Bhushan (2001), spoke on the theme Heart to Heart. In the jam-packed audience were Professor Abbas Mahdi Vice Chancellor Era University, LMA members, and many dignitaries. LMA organized a visit to Inviro Techno Lab on 2 December 2017. Founder of Invero is Mr. Milind Raj, 28 year old Milind, a technology genius who was recently conferred LMA Young Achievers? Award. Milind has invented a variety of awesome high technology applications like Automated Artificial Intelligent Robots of several varieties. Milind developed Robotic-Agriculture Technology that can efficiently reduce loss of crops due to improper and untimely spraying of fertilizer and more, and has designed a cutting-edge robot to forecast weather suitable for agriculture and farming and farm mapping technology. He has invented a world?s first intelligent ?PortBOT?robot that goes underwater and scan movement of ships and will overcome the risk of any intruding ship entering the countries. Milind?s another invention is Tech Innovation for Robotic Fast Delivery System in India with smart robots that fly in air and run on ground to substitute for couriers. Some of these applications can be seen as exhibits in Milind's Lab. Milind, Inverno robotics : Drone - Indian hawk, 12 kg self weight, can lift 55 kgs, can be used for medicine/food drop for emergency relief, can move at 130 km / hour, has been used for animal rescue recently, cost Rs 30 lakhs (can drop to Rs 10 lakhs in mass production), water and wind proof, can operate even at -20 degree Celsius. It is first of the kind made in South Asia so far. LMA organized a lecture session on Business Analytics and its Role in Organizations on 29 November 2017. NASSCOM and TiE Lucknow Chapter collaborated in the session. The speaker was Professor Amit Agrahari, Department of Information Technology Systems, IIM Lucknow. Prof Amit Agrahari has about a decade of academic and industry experience in business process redesign and software solution design focusing on the key domains of e-Governance, public procurement, and business analytics. He has co-founded South Asia's first public procurement observatory (with support from the World Bank Group) to advocate better procurement practices and SIDBI center for innovations in financial inclusion (With support from SIDBI) to nurture Fintech incubation. He offers consulting services in these domains and publishes book & research papers to disseminate his leanings. His recent consulting clients include the World Bank Group, Indian Army, Tirupati Devsthanam, PCDF, UPPCL, TRAI and Mumbai Rail Vikas Corporation etc. His book titled "e-Procurement in Emerging Economies: Theory and Cases" was published by IGI Global, USA. In collaboration with the Indiana University, USA, he launched a Certificate program in Business Analytics for Executives. YMF in collaboration with IIM Lucknow organized a workshop on Entrepreneurship by Josh Talks on 21 November. Speakers were Mr.Vedant Maheshwari from Josh Talks and Mr. Kumar Ranjan Director Mean Metal Motors. Young Managers Forum in collaboration Navyug Kanya Mahavodyalaya organized a workshop on Goods and Services Tax on 28 March 2017. The Lead speaker was Ms. Shalini Rai Chartered Accountant Partner of P. Srivastava and Associates. She is a guest speaker at many organizations like Institute of Chartered Accountants, Income Tax Training department. etc. In the series of Josh Talks, LMA Young Managers Forum organized a talk on 22 November in collaboration with Techno Group of Institutions. Speakers were Mr. Ashish Kaul President TiE Lucknow Chapter and Ms. Naminta Bhatia of Josh Talks New Delhi. The theme was Entrepreneurship. YMF in collaboration with MC Saxena Group of Colleges organized a workshop on Start-ups by Josh Talks on 22 November. Speakers were Mr. Ashish Kaul President TiE and Mr. Kumar Ranjan Director Mean Metal Motors. As a part of LMA's initiative on strengthening Academia-Industries Interface, an interactive session on Improving Internship quality and faculty exposure to industry was organized on 28 November 2017 in which several Heads of Engineering and Management Colleges participated. Prof Kailash Narain Pro Vice Chancellor Dr. A.P.J. Abdul Kalam Technical University was present among others. Young Managers Forum in collaboration with BSNV College organized a Workshop on ?Input Tax Credit under GST? on 27 November 2017. The speaker was Mr. Devesh Agarwal Chartered Accountant & coordinator YMF. Annual LMA Awards were conferred on (i) Prof Mahendra Bhandari Past President LMA in the picture )-Transformation Leadership Award (ii) Dr. Dheeraj Mehrotra, Vice President (Academics) with Next Education India Pvt. Ltd., Hyderabad- Creativity & Innovation Award, (iii) Professor Manju Agrawal, a social entrepreneur, researcher, and educationist, currently Dean Student Welfare and Founder Director of Amity Institute of Behavioural and Allied Sciences, Amity University, Lucknow Campus - Outstanding Woman Achievers? Award and Mr. Milind Raj. a technology genius and Founder of Innovation Company Inverotech- Young Achiever Award. LMA organized its Annual Convention 2017 on the theme Developing Smart Villages as Future of New Uttar Pradesh on November 25, 2017. The Chief Guest in the inaugural session was Mr. P.K. Lahiri Former Secretary Govt. of India and India?s Executive Director Asian Development Bank, Manila. Keynote speakers were ISRO Professor (Padma Shri) Dr. Y.S. Rajan and Dr. Sudhir Krishna Former Secretary, Govt. of India. There were three technical session on (i) Strengthening Institutions of Villages for Smart Governance, (ii) Transforming Physical, digital and Social Infrastructure, and (iii) Promoting Agriculture Reforms and Agribusiness and hastening Skill Development. There were eight domain experts who led the deliberations in the three sessions. A theme based convention Journal was released and 5 awards were conferred in the inaugural session. LMA Convention 2017 on the theme Developing Smart Villages as Future of New Uttar Pradesh organized on 25 November- Inaugural Session. LMA organized an outreach visit to Shivgarh block (Distt Raebareilly) to study a unique intervention by a non-profit Foundation Community Empowerment Lab which is working with a focus on reducing neo-natal mortality. CEL is a community-entrenched global health research and innovation organization based in Shivgarh. It is led by two public health experts, Dr. Vishwajeet Kumar, an alumnus and former faculty of Johns Hopkins USA and his wife Arti an ex-employee of Hewlett Packard Singapore. They chose Shivgargh, a rural block with country''s highest rate of dying new borns . With missionary zeal to reduce those ?numbers? and the associated collective sense of shame, they created, among some other innovative interventions, a simple skin-to-skin touch therapy without any medical applications, called Kangaroo Mother Care. This apparently simple intervention won CEL the Bill and Melinda Gates Foundation?s Grand Challenges award for reducing neo-natal mortality by 54% within 16 months and has been published in Lancet as a successful case study. CEL subsequently devoted themselves to the study of mental development of new born to devise interventions to address this menace which won them Canada Grand Challenge with a grant of close to $1 million as part of its Saving Brains challenge, purely on the strength of the idea and the potential of the team. Dr. Sean Deoni Director MRI Research at Memorial Hospital Rhode Island and Adjunct Professor at Brown University USA, who was visiting Shivgarh as a part of an International study on the subject, joined a very meaningful interactive session. The programme included a visit to the local Govt. CHC, one of many in U.P., transformed by CEL under NRHM, and interaction with local community, the principal stakeholders of the programme. Dr. Mahendra Bhandari Past President LMA joined the visit among others. LMA in collaboration with IIML Academy of of Higher Learning, Lucknow and PHDCCI organized a Seminar on ?Professional Survival Skills for Generation Z? on November 25, 2017. The programme comprised poster making and debating competitions besides talks on The Future Of Work and the Workplace by Mr. Saud Usmani Dy. G.M Tata Motors, Challenges for Future Professionals by Dr. Tripti Singh Fellow XLRI & Former IIM Bangalore Director at Drishtikon Consultants and ?How Generation Z can acquire Professional Survival Skills? by Mr. Mudit Arora HR Head Axis Bank. Padhakus Company? from Department of Business Administration, Lucknow University had brainstorming session on their business plan on. 15th November 2017. YMF-LMA a series of interactions in collaboration with Josh Talks as a part of its programme to develop start-up eco syste in Lucknow. The second was with IILM Academy of Higher Learning on 21 November 2017. The speakers were Mr. Kumar Ranjan Director Artificial Intelligence Mean Metals Motor Bangalore and Mr. Vedant Maheshwari Online Growth Manager with Josh Talks. As a part of its mandate to build start-up ecosystem in Lucknow, LMA organized its 4th Workshop on ?Building Business Plan? 21 November 2017 in collaboration with Shri Ramswaroop Memorial University which was conducted by Mr. Kumar Ranjan Director I Artificial Intelligence Mean Metal Motors Bangalore. After a brief introduction by Mr. Kumar, the participants were asked to present business plans ideated by them in teams of four. Out of seven plans presented, 10 groups of 4 students each offered to submit their idea together with business plans for taking them forward for implementation by the teams under his guidance and prepare for a bigger competition of funding round. Dr. Jyoti Dewan Chairperson Industrial Collaboration, Interaction & Entrepreneurship, SRMU along with some faculty members were present in the event. YMF-LMA organized a series of programmes in collaboration with Josh Talks. The first talk was in collaboration with Institute of Chartered Accountants on 20 November 2017. The speakers were Mr. Kumar Ranjan Director Artificial Intelligence Mean Metal Motors and Mr. Arbaz Hashmi Operations Head, Credenc, a startup at the confluence of education and finance technologies. Josh Talks is a media company headquartered in Delhi. It organizes conferences across India with speakers who deliver motivational talks to audiences, primarily young people. The company was named in a list of "Top 50 Start-ups of India" by Economic Times. One of Josh Talks' major partners is Facebook with whom they conduct conferences, workshops & boot-camps across the country to encourage entrepreneurship in India. Lucknow Management Association organized Lecture by Dr. Nilanjan Mukherjee on "7 Pillars of Success in Personal and Professional Life" on 11 November 2017. The speaker was Dy. General Manager Human Resource Relaxo Group and a corporate trainer with several multinational companies as clients An alumnus of IIM Lucknow, Dr. Mukherjee is Ph.D. (HR), M.Phil. (HR), MBA (HR & Mktg), PGDCA, GNIIT, B.COM (Taxation), Diploma in Labour Law, Diploma in Quality Management, and NELTS Qualified. He is a famed Speaker and has addressed to students and faculty members on multiple topics to more than 12,000 professionals in various academic institutions including IITs, IIMs and reputed organizations which comprises even the top management. Young Managers? Forum collaborated in Manfest Varchasva held from 17 November to 19 November 2017. Manfest-Varchasva is the annual Business, Sports and Cultural Festival of IIM Lucknow. The 3-day event is a confluence of Manfest, the Business Conclave and Varchasva, the Sports and Cultural Festival. Many iconic personalities from the business, sports and entertainment interacted with the students in this event which is arguably one of the biggest and most challenging management events in the country with multiple activities organized by students over 3 days. Mr. Firdose Vandrevala AIMA Past President was one of the speakers invited by LMA to interact with the students. LMA organized an Interface with Dr. Rajiv Kumar Vice Chairman Niti Ayog Government of India on 9 November 2017 in which he interacted with some LMA members and select invited guests on State of Indian Economy. Answering host of questions, he dealt in detail with macroeconomic issues before the country and Uttar Pradesh and how the Government was addressing them to make a long term impact on GDP growth rate and other economic parameters. Young Manager's Forum of LMA in collaboration with BSNV Post Graduate College organized a workshop on "Goods and Services Tax" on 11 November 2017. The Faculty of the programme was Mr. Devesh Agarwal. Mr. Agarwal is a Chartered Accountant and is coordinator of the YMF. Principal Rakesh Chandra and Head of Commerce Department BSNV College Dr. Madhu Bhatia were present in the programme among others. LMA in collaboration with a non-profit AWOKE India Foundation organized an interactive session on 15 November 2017 on "Financial Management in Changing Economic Environment". The session was led by Mr. Pravin Dwivedi, a Management professional and Founder President of AWOKE India group. Praveen is a former Banker with experience of working with several MNC Banks like Grindleys, Stanchart, and HSBC. On the first anniversary of demonetization, LMA organized a panel discussion on the theme Impact of Demonetization on Macroeconomic Situation and Prospects on 8 November 2017 in the Conference Hall of LMA in Scientific Convention Centre 1 Shahmina Road Lucknow. The panellists were Prof ID Gupta former Head Department of Economics, University of Lucknow, Prof Yashvir Tyagi and Prof. Arvind Awasthi both from Lucknow university. The panel agreed on the statement that Lower growth with Clean Economy was better than high growth with Black Economy-Say Experts in LMA panel discussion. Young Managers Forum collaborated with Bhrahm Kumaris Ishwariya Vishwavidyalaya and BBD University for a talk on Strategies for Success by Mr.E.V. Gireesh on 3 November 2017. Mr. Gireesh is an experienced Corporate Trainer and Life Coach based in Mumbai. His clients include eminent names like ISRO, NABARD, SBI, Indian Army, Reliance Industries, Tata Motors, IOC, HPCL, Cipla, TISS, IIT Patna and many others. He is Post-Graduate in Applied Psychology and MBA in Marketing and Finance. LMA organized a lecture on "Changing Landscape in Management Education by Professor Mirza Saiyadain on 28 October 2017. Prof Saiyadain, Business Educator and a senior academic took his Master in Arts from University of Hawaii and Ph.D from University of Kansas. He taught at University of Kansas, Lawrence, University of Sains Malaysia, Penang, University of Lagos, Nigeria, McGill University, Montreal, Canada and Indian Institute Management, Ahmadabad for 16 years. He was Member Senate, University of Sains Malaysia, Penang. Member Board of Directors McMillan India Ltd, Grantee East-West Center Honolulu and Vice President and Advisor National Institute of Personnel Management. LMA in collaboration with Institute of Corporate and Cooperative Management Research & Training (ICCMRT) organized a Workshop on "Making Start-up Business Plans conducted" by Mr. Kumar Ranjan Director Artificial Intelligence Mean Metal Motors Bangalore. After a brief presentation by Mr. Ranjan, the participants were required to ideate and present their business plans. Nine ideas were generated in the workshops and teams of four participants each presented their business plans. The four business models selected were ?Introducing Sugarcane products into FMCG market under B2B segment?, ?Waste management and recycling techniques (There were 2 teams with different business models)? and ?Herbal tea with natural organic sugar? on which the participants would work further with Mr. Ranjan. As a sequel to the Interactive session on Industry Academia Interface held on 26 October 2017, LMA organized a presentation on Inclusion of High Technology Subjects in Curriculum at Centre for Advanced Studies, Dr. APJ Abdul Kalam Technical University on 30 October 2017. The presentation was made by Mr. Kumar Ranjan Director I Artificial Intelligence, Mean Metal Motors Bangalore in which he introduced some advanced technologies like Artificial Intelligence, Chatbot, Bitcon etc and their possible applications. Besides LMA Vice President Mr. Mathur, Prof Manish Gaur Director Centre for Advance studies, AKTU, Faculty and M. Tech students of AKTU participated in the session. Subsequent to the presentation, a proposal was mooted by Director Centre of Advance Studies to enroll interns to work on some credit bearing projects on applications of these technologies as a part of the curriculum of M.Tech programme of AKTU under supervision of Mr. Ranjan. As a part of LMA?s initiative to develop start-up ecosystem in Lucknow/U.P., a workshop on Developing Start-up Business Plan was organized in collaboration with Lucknow Entrepreneurship and Development Society (LEADS) and Department of Business Administration, University of Lucknow on 26 October in which participants in groups of four were required to ideate and prepare business plans under for the guidance of Mr. Kumar Ranjan Director Artificial Intelligence, Mean Metal Motors Bangalore, a start-up developing an electric driverless car and Founder of LEADS. The workshop participants generated six start-up ideas Pretty Me, Stress to Strength, Herbs Bouquet, Padhakus, Paradise Event Planners and Chai-tonic. LEADS will be working with these teams and will shortlist the best teams to a Pitch in competition being planned by LMA to raise the first seed fund round. Many Bollywood movies like Lagan and Three Idiots have useful Management Lessons which impact young minds. YMF in collaboration with Faizabad Management Association organized a workshop on Management Lessons from Bollywood on 13 October 2017. Mr. Devesh Agarwal Chartered Accountant and coordinator of LMA?s Young Managers Forum conducted the workshop at Faizabad. LMA in partnership with IIM Lucknow organized a conference on Creating an Eco-system for Start-ups in Lucknow/Uttar Pradesh on 20 September 2017. The event was supported by Niti Ayog, Govt. of India and was inaugurated by Hon. Governor of Uttar Pradesh Shri Ram Naik. Mr. Amitabh Kant CEO Niti Ayog (who had to cancel his visit at the last minute and was represented by Mr. Yogvendra Mathur Additional Secretary Knowledge & Innovation Niti Ayog), Mr. Sanjeev Bikhchandani Executive Vice Chairman Info Edge (India) and Mr. Sanjiv Saran Principal Secretary were Guests of Honour. Policy makers, start-ups/mentors, Venture Capitalists and Angel Investors interacted with students of various institutions, start-ups, incubators on the theme. The Session 1: ?Fuelling Rapid Growth of Start-Ups_ Investor?s Perspective? had Mr. Mr. Anand Govindaluri Founder & CEO, Govin Capital, Singapore, Mr. Mudit Narain Founding Manager Atal Innovation Mission Niti Ayog, Mr. Vaibhav Agarwal Associate Partner Lightspeed India Partners Advisors LLP, Mr. Vivek Khare Director Strategy Let's Venture and Mr. Anjani Kumar Srivastava from SIDBI. Ms. Samina Bano, a social activist and mentor of start-ups at IIM Bangalore chaired this session. Session 2: ?Role of Incubators and Accelerators in Building up Start-Up Ecosystem? was chaired by Prof Vinay Pathak Vice Chancellor APJ Abdul Kalam Technical University and the panelists were Mr. Srijan Pal Singh CEO and Co-Founder of Dr. A.P.J Abdul Kalam Centre for Innovation and Incubation, Ms. Sunita Singh Executive Vice-President, Global Initiatives Wadhwani Foundation and Co-Founder, National Entrepreneurship Network, Ms. Swati Pandey Co-founder and CEO Arboreal Innovations and Mr. Apoorv Sharma Program Manager at Oracle Startup Cloud Accelerator. A student?s presentation competition was also organized in which 8 teams from various institutions presented business plans for start-up ventures. Mr. Ananad Givindaluri of Govin Capital Singapore announced a funding support of of Rs. 10 lacs for winner team. LMA in collaboration with Navyug kanya maha Vidyalay organized a memory Training Workshop ?Forget Forgetting? on 1 September 2017. A supplement to classroom Learning. Forget Forgetting is a Memory Management Workshop which consists of Memory Techniques, Speed Reading Skills, Brain Maps and other Smart Study Skills. The session was conducted by mr. Devesh Agarwal. Chartered Accountant by profession, Devesh is founder of startup Forget Forgetting. Young Managers? Forum of Lucknow Management Association is joined Avadh Girls? Degree College in the National Seminar on ?Mobile Commerce. : Strategic Perspectives and Concerns in Emerging Cashless Economy? on 16th September, 2017 at Avadh Girls? Degree College. Dr. Niel Jain, IRS Additional Commissioner Income Tax was the Chief Guest. Two key note speakers were Mr. Shailesh Chaturvedi MD & CEO Tommy Hilfiger and Ms. Anjit Anand, Product Head Mobility , DCB Bank Limited. Besides the inaugural session, there were two sessions, one on (a) M Commerce and Economic Development, (b) Legal and Ethical Issues in M Commerce, (c) Emerging Trends in M Commerce. Session II was on (a) Environmental Issues in M Commerce, (b) E Commerce Vs. M Commerce, (c) Cashlesss Economy in India and around the Globe. LMA in collaboration with LeadWynn conducted internship training of MBA students from various institutions.12 interns participated in the programme during June 1 to 30 and submitted their project reports prepared under the guidance of Dr. Rajan Johri and Dr. Alka Jain of LeadWynn. Prof Richard Dien Winfield of the US interacted with the intern and offered valuable inputs on the work of interns. LMA collaborated with TiE (The Indus Entrepreneur) Lucknow Chapter and Jaipuria Institute of Management in Story Session followed by Panel Discussion on ?Redefining Retail with E-Commerce? on Sunday !oth September Forenoon . In the story session three entrepreneurs shared their E-Commerce Success stories and discussed Current Challenges in E-Commerce and the way forward. The panellists were Mr. Manan Sharma Founder, Indiangiftsportal- IGP.com., India's largest Gifting Company with customer base across the globe. four offices in India - Mumbai, Noida, Jaipur & Lucknow - and one office in Los Angeles, California, Mr. Vinod Punjabi Founder ADA Chikans and a leading Business Entrepreneur in Lucknow, who took his traditional garment business online and succeeded in building a successful brand and a profitable e-tailing model and Ms. Kareshma Khanna Founder Click your Med. She has just launched an online pharmacy in Lucknow with a vision to bring transparency & affordability. Young Managers? Forum of LMA collaborated with Brahma Kumaris in 3D Health Care for Healthy Mind and Body through Meditation ie. Rajyoga on 10 September 2016. Dr. Satish Gupta Sr. Consultant in Cardiology and Medicine, Watmaull Global Hospital & Research Centre, Mt. Abu was the speaker. Hon'ble Siddharth Nath Singh, Minster of Medical & Health, Uttar Pradesh was the Chief Guest. LMA organized a talk by Dr Richard Dien Winfield on the Topic: Challenges of Democracy in USA and India- New Social Bill on Wednesday 30th August 2017. Dr Winfield talked on campaign for a new social bill of rights anchored on the true right to work and its significance for both the USA and India. Bachelor in Philosophy, Yale College, New Haven, Connecticut, Master of Arts in Philosophy, University Heidelberg, Germany, Doctor of Philosophy in Philosophy, Yale University, New Haven, Connecticut, Dr. Winfield is a Distinguished Research Professor University of Georgia in Athens since 1982. He is a Global thought leader and has authored many books, his twentieth book now being in press. He is about to run for the US Congress. Young Managers Forum in collaboration with Department of Commerce JNPG College launched a study Centre on 18 August 2017. With an objective of making graduates industry ready, the Centre will run short courses in Basic Accounts, Business Laws, Company Law, Business English, Mathematics, Logical Reasoning, Statistics and Business Economics. There will also be a 30 hours programme on Soft Skills and memory training, Centre will organize Quiz, Debates, Moot Courts, extempore speech making and, presentations competitions. Centre will also organize industrial visits for Students and felicitate internships. Mainly Chartered Accountants, Company Secretaries, Cost Management Accountants and corporate executives will be taking sessions in various programmes. Mr. B.B. Jindal, a veteran Chartered Accountant and Past President LMA was the Chief Guest in the launching of the Centre. Young Managers Forum organized a Workshop on "Career Alternatives for Commerce Students" on 5 August 2017 in which various criteria for choosing careers by students were discussed. Information was shared about new procedures for enrollment in Chartered Accountancy course and programme on GST, improving soft skills, computerized accounting and Foreign Trade. Mr. Devesh Agarwal Coordinator YMF, Dr. Salil Chandra, Dr. A.K. Awasthi and Mr. Ashok Tewari of JNPG College were on the faculty of the workshop. LMA collaborated with Clean and Green Environmental Society (CGES) in the 2nd Foundation Day celebrations of the Society on July 8, 2017. Dr.P.V.Sane Former Director CSIR National Botanical Research Institute was the Chief Guest and Dr.D.K.Upreti Former Chief Scientist CSIR National Botanical Research Institute was the Guest of Honour. Dr. V.P. Khamboj Former Director CSIR National Drug Research Institute delivered the Foundation Day lecture. LMA organized an AIMA-FMA interaction at Faizabad on 1 July 2017 for affiliation of newly constituted Faizabad Management Association with AIMA. Mr. Sanjay Grover Director LMA Relations represented AIMA. Besides the office bearers of FMA led by President Mr. L.K. Jhunjhunwala, Mr. A.K. Mathur Vice President and Executive Director Lucknow Management Association participated in the interaction. 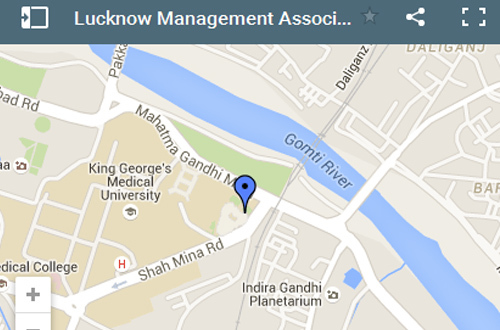 Lucknow Management Association will be mentoring FMA for its growth. KravMagas a self-defense system developed for the Israel Defense Forces (IDF) that consists of a wide combination of techniques sourced from aikido, judo, boxing and wrestling, along with realistic fight training. KravMaga is known for its focus on real-life situations and its extremely efficient, and against brutal counter-attacks, it promotes finishing a fight as quickly as possible. By this, one can learn to defend against all variety of attacks and are taught to counter in the quickest and most efficient way. Keeping safety of Women in mind and to make women self-dependent for their security, LMA took the initiative to conduct a training session in collaboration with Red Brigade Lucknow, a registered non-governmental organization founded by Usha Vishwakarma which focuses on empowering women through self-defense education. A 3 hour training session was conducted for young girls on 7 July 2017 by a French group lead by Mr. Michael who is black belt champion and Self-defense trainer and also an expert in the KravMaga Technique. LMA collaborated with Indian Institute of Architecture, IIT Roorkee Alumni Association and TERI to organize a Workshop on ?Technical and Regulatory Nuances of Green Buildings? on 3 July, 2017. The subject is vital for improving energy efficiency of residential and commercial buildings mandated by Energy Conversation Act 2001. Dr. Ajay Mathur Director General TERI delivered the keynote address on ?Cost-Benefit of Green Buildings to Individuals, Organizations and Society?. Besides, there were two sessions on? Material and technology to make buildings green and sustainable; Model self sustaining buildings; Making Design considerations for sustainable Green high rise and small buildings? and ?Rating System for Green Building; Regulatory Framework; Measures to incentivize compliance? conducted by faculty from TERI. Mr. Kumar Keshav Managing Director Lucknow Metro Rail Corporation delivered a special address on ?Lucknow Metro : Green Initiatives in Building Modern Urban Transport System? . Shri Nand Gopal Gupta ?Nandi?, Hon'ble Minister of Stamp and Registration and Civil Aviation, Govt. of Uttar Pradesh inaugurated the Workshop. As a sequel to the Outreach programme at the Farm of Sri Ram Sharan Verma, a progressive Farmer of Barabanki on 14 May 2017, LMA in collaboration with Institute of Cooperative and Corporate Management Research & Training has taken up a research study on ? Socio- Economic Impact of Crop Diversification on Farmers in Daulatpur Village (Barabanki)?. As a prelude to this study, LMA organized a Farmer?s Workshop on 2 July 2017 to define the research parameters and initiate data collection. Prof Jabir Ali Principal ICMRT and a Former faculty of Agribusiness in IIM Lucknow, Mr. A.K. Mathur Vice President LMA and Sri Ram Sharan Verma participated in the workshop besides about 25 Farmers from the region. Mr. Alok Ranjan President LMA, Mr. A.K. Mathur Vice President & Executive Director LMA and Sri Ram Sharan Verma, a progressive Farmer of Barabanki met Hon?ble Governor Shri Ram Naik on 30June 2017 to invite him as the Chief Guest in the National Workshop on Horticulture being jointly organized by LMA with Sri Ram Sharan Verma at his Farm in Village Daulatpur (District Barabanki) on 22 September 2017. Hon?ble Governor graciously accepted the invite. It is pretty likely for just about everyone who practices yoga regularly that their life has been touched in some way by its transformative power. But because these changes often take place over time, as part of a subtle and organic process, it can sometimes be hard to pinpoint exactly what it is about yoga that helps you to live a better life. To understand what Yoga can do to our life, LMA organized a lecture by Professor Himanshu Rai of IIM Lucknow on the subject Yoga and Life on 21 June 2017, the International Yoga Day Besides being a professor of HR and Organization Behaviour, Dr. Rai has deep understanding of scriptures and is an articulate global speaker on subjects like Justice, Ethics & Morality and Ethical Leadership. Dr. Himanshu Rai expounded a little different aspect of Yoga from his profound understanding of scriptures and also dealt with Leadership issues propounded in Geeta. On leadership, Himanshu said, "a true leader is almost always a Yogi in terms of the consonance between thoughts, words and deeds". LMA in collaboration with Department of Physical Education, University of Lucknow and Lucknow University Alumni Association organized a one hour Yoga training and practice camp under guidance of Yoga instructors on 22 June at 6.30 am at Lucknow University Shivaji Grounds as a part of LMA?s International Yoga Day events. Among others, Prof S.P. Singh with his wife, Mr. Atul Former DGP U.P. and President Lucknow University Alumni Association, M. Anant Jauhari Secretary Lucknow University Alumni Association Prof Neeraj Jain Head Department of Physical Education, University of Lucknow and several faculty members of the University took part in the yoga practice. LMA Collaborated with Centre for Innovation and Incubation of Startups of Dr. A.P.J. Abdul Kalam Technical University, Lucknow in an interactive session on Developing a Cohesive Startup Ecosystem for students/alumni of the University on 17 June 2017. The interaction on the subject was around the two presentations. One was by Mr. Srijan Pal Singh, an IIM Ahmadabad alumnus, a social entrepreneur and advisor to Late Dr. A.P.J. Abdul Kalam for five years till his last moments. He promoted Dr. Kalam?s various assignments and also coauthored four books with him. The other presentation was by Mr. Anand Govindaluri Founder & CEO of Govin Capital Pte Ltd Singaore, an angle investor who is committed to support Start Up activity in Andhra Pradesh, Rajasthan and now Uttar Pradesh. Besides Prof Vinay Pathak Vice Chancellor AKTU and his faculty colleagues, Heads of several AKTU affiliated Institutions and professional organizations like TiE, SIBDI, CII, IIA etc participated in the interactive session. LMA has been supporting the project of transformation of 100 government primary schools in and around Lucknow by the nonprofit I Care India being run by Mr. Annop Gupta, a life member of LMA. The project has been remarkably successful in moving towards its goal and has been able to secure the support of all stakeholders Viz. the government, volunteers, civil society, parents and local community and village administration. Some of the schools have shown amazing improvement on all counts. On 5 June 2017, the World Environment Day, an outreach visit to one of the primary schools at Jagmohan Purva primary school located in Gossiaganj Block (Sultanpur Road), Lucknow was organized to participate in the World Environment Day celebrations in which NTPC, a CSR partner in the project is supporting I Care India. LMA in collaboration with LeadWynn and Ek Sankalp Society organized a Workshop on Awareness of the Power of Service and Scope of Personal Growth on 2 June 2017 for of nursing attendants providing home care services to elders in Lucknow. Ek Sankalp Society is being run by Indira Talukdar MBA, an Alumnus of Jaipuria Institute of Management, who after leaving a corporate job has devoted herself in the service of elders needing nursing care. She has her own establishment in addition to provide home care service. Young Manager Forum of LMA organized a 3 hour workshop on Management Lessons for Students on 1 June 2017 The Workshop had two sessions, one on Memory Management and other on Management Lessons from Bollywood. The Workshop was conducted by Mr. Devesh Agarwal. Devesh is a Chartered Accountant and is Coordinator LMA?s Young Manager Forum. LMA in collaboration with Rotary Club Lucknow, IIT Roorkee Alumni Association and Indraprastha Apollo Hospital New Delhi organized a Seminar on Wellness in Present Day Lifestyle on 28 May 2017 Two eminent professionals in the field of Cardiology and Oncology from Apollo Hospital were the resource persons in the Seminar, who spoke on the subjects of their specializations. Dr. Monica Kher, a Consulatant Cardiologist at Indraprastha Apollo Hospital, New Delhi spoke on- Heart Diseases ? Prevention & Treatment and Dr Manish Singhal Senior Consultant, Medical Oncology in Apollo Hospitals, New Delhi spoke on Menace of Cancer & Preventive Measures. Dr. Monica Kher did her super specialization in Cardiology from Batra Hospital New Delhi and underwent extensive training in invasive and non-invasive cardialogy at the same hospital. She is actively involved in teaching, research and awareness programmes for preventing heart ailments and leading a healthy life. Dr. Manish Singhal earlier worked as Senior Consultant, Medical Oncology, Dharamshila Hospital and Research Center and Consultant and Head of Department, Medical Oncology, Fortis Hospital Noida. He got his formal training in Medical Oncology (DM) from AIIMS, New Delhi and then underwent advanced training at Oriel College, Oxford University, UK and Barbara Ann Karmanos Cancer Center, Detroit, USA. Dr. Singhal is the first and the only Indian to top the ESMO (European Society of Medical Oncology) Examination in 2013, scoring world rank 1. Dr. Singhal has authored several research papers in Indian and International Journals and is a member of many societies in the field of Oncology in India and abroad. He specializes in breast cancer, Lung Cancer, Gastro-intestinal cancer and Lymphoma/leukemia/myeloma. LMA organized an interactive session preceded by a presentation by Mr. Saurabh Saha Promoter of a Bangalore based start up geekshala.in on Creating an Eco-system for Entrepreneurship in Lucknow/U.P. through IIML. Mr. Saha has experience of creating several start ups in Bangalore after having worked in technology companies in Bay area California and Europe. He has agreed to collaborate with LMA in developing much needed entrepreneurial culture in Lucknow and made many proposals for the same in his presentation which was attended by professor Ajit Prasad Director IIM Lucknow and about 30 faculty members. LMA organized a talk on Leading and Managing a family Business by Dr. Hitesh Shukla Professor at Department of Business Management, Saurashtra University, Rajkot (Gujarat) on 23 May 2017.Dr. Shukla teaches and consults in family businesses and has advised a large number of family businesses, large and small and helped them to meet various challenges, convert their traditional businesses into competitive market and system driven business. He has authored a large number of cases on family businesses. His case on Corporate Governance of Satyam was well received by family business owners. His two cases on family based business have been registered with the Case Unit, IIM-Ahmedabad and one with IVEY Publishing (available on HARVARD website: https://cb.hbsp.harvard.edu/cbmp/product/W13418-PDF-ENG). He has six books to his credit, including recent publications ?Corporate Governance in India and Family Based Business: Roots to Roughs. He has been invited by the National University Singapore, State University of Indonesia and Malaysia for seminars on family businesses. LMA in collaboration with Rotary Club of Lucknow organized a wellness talk on Hazards of Smoking, Tobacco Usage & Gutka Chewing on 19 May 2017. The speaker was Dr. Surya Kant Tripathi Professor & Head of Department, Respiratory Medicine, Pulmonary & Critical Care, King George?s Medical University.. Tripathi is one of the renowned Pulmonologists in Lucknow city, to have bagged numerous awards commemorating his professional excellence. He treats a broad spectrum of conditions like TB, Asthma Allergy, COPD, Sleep Breathing Disorder, Interstitial Lung Disease (ILD) and life threatening Lung Cancer. A strong advocate of prevention of disease, Dr. Tripathi promotes patient education and awareness to keep health problems at bay. He has furnished more than 200 articles in newspaper and magazines for creating awareness among the masses. Fellow of American College of Chest Physicians (FACCP)- USA., Fellow of International Medical Sciences Academy (FIMSA)- New Delhi, India, Fellow of Indian Chest Society- India and Fellow of National College of Chest Physicians- India, he is credited with 370 papers in national and international journals, 5 books and 21 chapters in various books. LMA in collaboration with PHD Chamber of Commerce and Industry organized a talk on Indian Railways- Initiatives in Ease of Doing Business on 20 May 2017. The speaker was Mr. Sanjiv Garg Additional Member Railway Board, Ministry of Railways, Govt. of India. In his comprehensive presentation, Mr. Garg, a post graduate in economics from Dslhi School of Economics and MBA from MDI Gurgaon, articulated a large numbers of initiatives taken by Railways in Freight and Passenger segments. In the freight segment, he highlighted interventions to improve customer focus, competitive tariff, terminal capacity enhancement, expending freight basket, time tabled trains, new delivery models and dedicated freight corridor. Among a slew of passenger sector initiatives, he spoke of improved ease of booking, making train travel a memorable experience , fulfillment of passenger?s demand, more options of improved quality catering, engaging with passengers by connecting and responding online and introduction of a number of high profile branded trains. In an outreach programme, LMA organized a visit to farms of Mr. Ram Sharan Verma in village Daulatpur in Barabanki District, about 39 kma from Lucknow on 14 May 2017. Sri Ram Sharan Verma, a non metric by education but a high tech farmer is not only known in the State and the country but in some 40 countries around the world. This is because of some unique varieties of Banana, potato, Tomato and Mentha developed through innovative techniques for which he has been honoured by highest dignitaries in the country and has received many awards at District, State and National levels. He was also appointed as Agriculture Adviser by Modi Government in Gujarat. With a modest beginning, Ram Sharan Verma has not only enriched himself through agriculture but has brought prosperity to thousands of farmers by teaching them new techniques. Because of prosperity Sri Ram Sharan has generated, not only migration from that region has stopped, reverse migration from cities has been triggered. Through his Hi-Tech Agriculture & Consultation, created by him, Ram Sharan Verma provides free consultancy to farmers. Around 1, 00, 000 farmers have benefited from his experience. About 30 LMA members joined the outreach programme and has useful takeaways. LMA collaborated with Headstart, a Bangalore based nonprofit dedicated to promote entrepreneurship and start ups in organizing an event Start up Saturday-All about Fund Raising on 13 May 2017. This was an interactive session on how start ups can secure funding, an essential requirement for scaling up start up venture, in which young startups participated. Two experienced start ups and angle investors Ashish Kaul (Entrepreneur & Investor | Founder President, TiE Lucknow) and Vineet Sagar (Managing Partner - Venture Garage) physically present in the event responded to live problems in attracting funding and two others from Indore and Hyderabad participated through video conferencing. LMA in collaboration with IIT Roorkee Alumni Association organized an Awareness Programme on Energy Conservation for Children on 11 May 2017 at Maharaja Agrasen Public School. The programme was conducted by Mr. Jeetesh Srivastava and Mr. K.K. Asthana. worked as a Civil Engineer & Environmental consultant in The World Bank funded project in Pradhan Mantri Gramin Sadak Yojana. He also worked with eminent Theater personalities like Barry John in Delhi, Nadira Babbar in Mumbai & with film personalities like Bhimsen (in Gharonda Movie fame) & Ram Gopal Verma. Mr. K.K.Astahana is the Chief Architect in U>P> Rajkiya Nirman Nigam. He has designed many important buildings including the newly constructed High Court Building in Lucknow. Mr. Asthana is a well known writer too. His articles are regularly published in Hindustan Times. He has recently been awarded Shan-e-Awadh. LMA and NHRDN collaborated with Harcourt Butler Technological Institute Kanpur in Management Conclave on ?Changing Paradigms of Management Practices: Sustainable Development and Employability of Indian Youth? on 20 April 2017. Speakers included Prof. S. Solomon Vice Chancellor, Chandra Shekhar Azad University, Kanpur, Dr. R. K. Trivedi Director STEP-HBTI, Mr. A.K. Mathur Vice President & Executive Director LMA, Mr. Saud Usmani Sr. Manager HR Tata Motors and Dr. Rajan Johri Managing Director LeadWynn. YMF-Heastarts-TiE in collaboration with Department of Business Administration, Khwaja Moinuddin Chishti University Lucknow organized the 9th Workshops for young managers on Basics of Starting Up on 20 April 2017 Following resource persons conducted the sessions. 1. Somil Bhatnagar worked as a Senior Technical Support and Customer Support Associate in one of the world's leading computer manufacturers, Dell in the US and U K. He now runs his Company BDeveloper as Operations Director. BDeveloper provides dedicated support resources, virtual assistant, virtual employee of clients to provide them business support, customer support, sales support and technical support services by working LIVE along with them. 2. Sabaa Shyamlee Director Communication at BDeveloper is MBA from symbiosis International University. Her role includes Social Media Management and Content Strategy, Team training and Human Resource Policy Design and Project Management and Client Servicing. YMF-Headstarts 8th Workshop on Basics of Starting Up was organized at on 18 April 2017 at Department of Business Administration, University of Lucknow. Headstart is a Bangalore based nonprofit with chapters in 20 cities which supports entrepreneurship and start ups in the country. Faculty comprised Mr. Ashish Kumar Pandey (Founder of three start ups www bminds technologies pvt ltd, CityPage3? and The Tuition Teacher, BCA in Computers from IISE Lucknow, MBA from SVSU and MDP from IIM Lucknow) and Mr. Vikas Gupta (an alumnus of IIT-BHU and IIM-Kolkata with over 20 years corporate experience with last two assignments in corporate leadership positions in Reliance Communications and Matrix Cellular and currently, running an entrepreneurial venture in Solar energy). Vikas has Conducted extensive training sessions spanning varied functions - Customer Service, Sales & Distribution, Business information systems, Personal effectiveness and development, etc. in various institutions including IIM Lucknow. Prof Usha Bajpai Professor at Centre of Excellence in Renewable Energy Education and Research, University of Lucknow, Lucknow also spoke in the workshop. A book, titled Ecology & Environment authored by an LMA member Mr. R.N Bhargava CMD, Ecomen Laboratories Pvt. Ltd along with three co-authors from the United States, published by The Energy & Resource Institute (TERI) was released by Hon?ble Governor of Uttar Pradesh, Shri Ram Naik ji on April 6th, 2017. Among LMA members and other distinguished guests, Prof Alok Dhawan, Dr. Sengupta Director of Knowledge Management Division and Chairman of MBA Programmes in TERI University and Padma Shree Dr. Nityanand Former Director Central Drug Research Institute were also present on the occasion. A Talk by Swami Dhruv on Spouse Management and 12 good habits for happy conjugal life and Peace was organized on 7 April 2017. Speaker was Acharya Shree Swami Dhruv, an Astrologer, Motivator, Counsellor and Corporate Trainer by profession. He is also the founder of Srishti Foundation, Universal Spiritual Center, Srishti Sadhana Kendra Nepal & Spiritual Institute of MIND MANAGEMENT. In its series of Workshops on Basic of Starting Up, YMF-LMA-Headstarts organized the 7th Workshop on Starting a New Business on 7 April 2017 in collaboration with Institute of Cooperative and Corporate Management Research & Training. The Workshop was inaugurated by Shri Mukut Bihari Verma, Honb?le Cabinet Minister for Cooperatives, Government of Uttar Pradesh Speakers were Mr, Jatin Srivastava CA and Mr. Anurag Rastogi CEO Newsapp. A Fellow Chartered Accountant and earlier an Investment Banker with JPMorgan Chase, Jatin is a serial entrepreneur. He has successfully run and exited ventures in his early career and is. currently serving as Partner with Seth & Associates, a renowned Chartered Accountancy firm in Central India. As a startup expert, he has also been associated with numerous early stage and growth stage startups in various capacities as Mentor, Advisor, Board Member and CFO. Several of these entities have been incubated, accelerated or funded. Anurag Rastogi founded Newgenapps - a world-class mobile and cloud development company, in 2008 with the vision of building a world-class IT company from Lucknow. Newgenapps works with many well known startups and Fortune 500 companies. He also started Xiffe.com a world class product company with users in more than 96 countries. Anurag is also instrumental in promoting the startup-scene in Lucknow.